Unfortunately the studios at the Atrium are now fully booked, so the final version of Adamsdown Song won’t be completed until after Easter. However, Gwill, the studio engineer, has managed to make a rough mix of the song with pupils’ vocals to be going on with. That should be going up on the Adamsdownhere website (link on the right) and can also be found on the download page here. Meanwhile all the artwork and poems should be finished this week, and the CD cover will then be chosen. The Atrium mobile studio spent this morning at Stacey Primary and the afternoon at Adamsdown Primary, recording the vocals for Adamsdown Song. All three local schools provided singers. The solo singers did amazingly well, especially under the pressure of being recorded, and the group choruses weren’t bad either! There are a few stray notes to straighten out in the studio, then it will all be mixed down with some overdubs to create the finished product. More news next week on that. The Song for Adamsdown project is not far off completion. Local writer Jon Blake made initial visits to Adamsdown’s schools at the start of March, discussing the history of the area and getting ideas for lyrics from pupils. The lyrics and music were then written and presented to the schools. 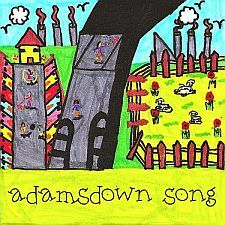 The backing track for Adamsdown Song was recorded on Monday 16th March at the Atrium studios. Richard J Parfitt, formerly of the 60ft Dolls, guested on guitar. Now it’s down to the pupils to supply the vocals, which will be recorded in the three Adamsdown schools in the coming week (23-27th March). Then it will be a matter of final overdubs and getting the CDs printed. Pupils from the schools are also doing artwork from which a CD cover will be chosen. Some examples from Tredegarville Primary are shown here. A launch event for the song is being planned, together with publicity on local and all-Wales media – more details to follow.